The photo you see above is a watercolor painting on a piece of plexiglass. There is a white piece of paper underneath because I am painting on top of a cherry desk surface. I wanted to see the colors that I was using to come through. I love bright colors, by the way. That is the advantage of using plexiglass. If you can’t draw very well, you can use a photo or an image under the plexiglass and use that as a reference for your painting. First – decide what you want to paint, if you’re using an image, tape it on the work surface. If not, I recommend taping a white piece of paper under the plexiglass that way you can get the true colors on your plexiglass, not getting it muddled with whatever color surface your work surface may be. Like my desktop, which is cherry. Next, the plexiglass is coated with dishwasher soap. Yes, it is. Why? It helps to make it easy for the watercolor paint to come off the surface when we’re ready to make a “press” of the image. It is a cost effective way than using gum arabic. I let the the soap dry on the plexiglass. While I am waiting for it to dry, I am organizing my colors, brushes, getting my cup of water filled, my cloth to clean my brush (I like using cloth, saves on paper towels). If I’m impatient, I use a hair dryer to speed up the drying process. Then I tape the plexiglass over the image or white paper so it doesn’t move while you’re painting. Now, we’re using watercolor paints. I apply it thick and liberally on the surface and it will dry quickly. 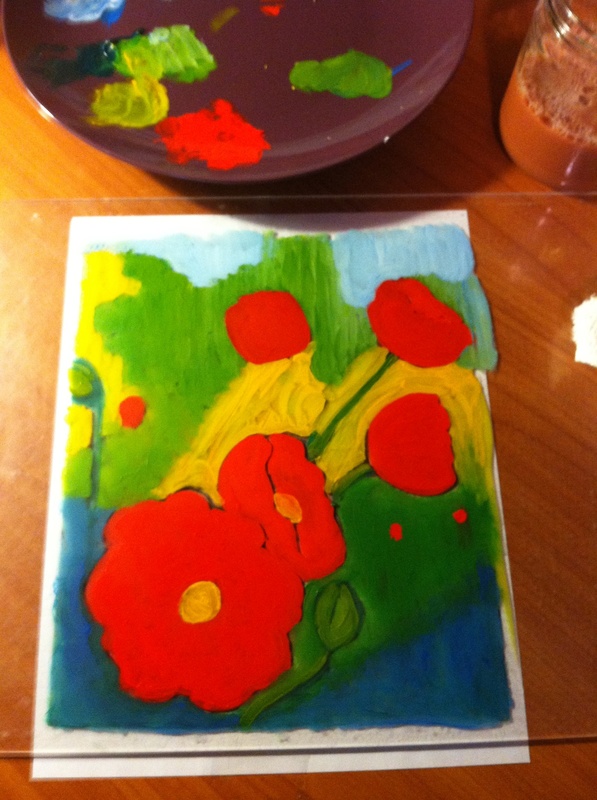 Thus, you’re going to end up painting quickly as well once you see how the paint dries on the plexiglass. I don’t add water to the watercolor paint. I just dip the paintbrush into the paint and go directly onto the plexiglass. Once it is dry, if I want to add another color or another coat, it must be thick so that it will not “scratch” away the first coat. Once we’re done, we get our watercolor paper. I use 90 lb cold press watercolor paper and we go soak it in water for 5 minutes. This is good time to clean the brushes and dump the dirty water cup. At home, I use my sink to soak my paper. After 5 minutes, I let the water run off and then stick it in between two sheets of newsprint paper. Pat it dry. We want the paper moist, not soaking wet. Now, the print is damp. If it looks like there are some areas that the paint did not transfer over, I would pick up one of my brushes, and go over it, to cover up the “white spots”. Once I am satisfied, I let the print dry on a flat surface. Once the monoprint is dry, we have opportunities to do more things with it. We can be completely happy with it, and frame it. We can cut it and put it on a notecard, or we can embellish it (making it into a mixed media) or we can add to it. 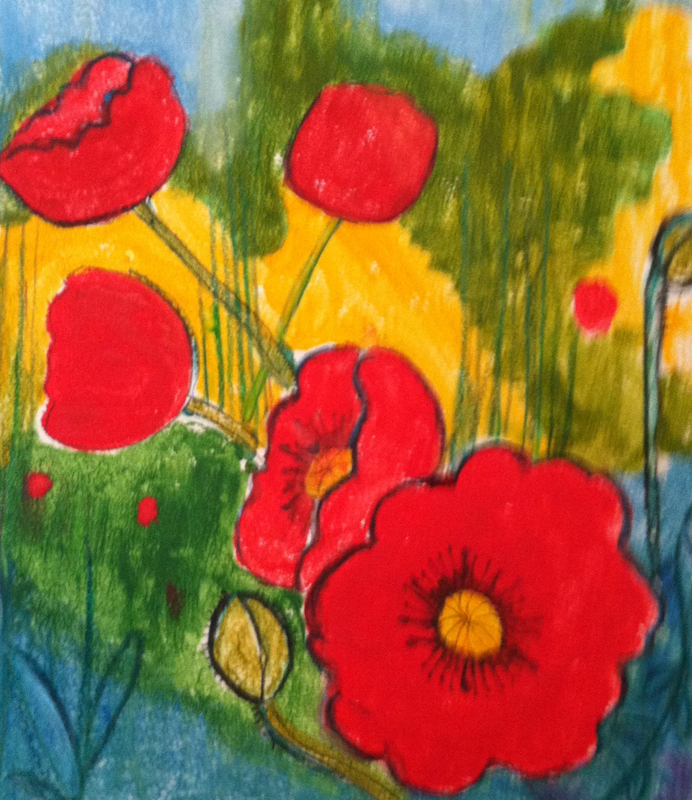 Red Poppies – the finished piece. I love monoprinting. 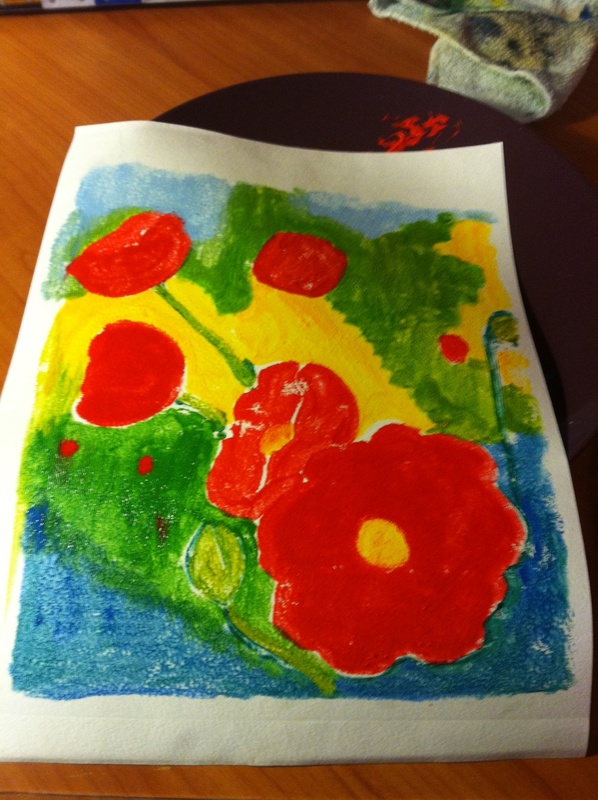 Watercolor monoprinting allows me to do it without having a press. I don’t have a press . . . yet. I hope to have one soon, some day. When I do purchase it, I plan on making it a “portable” one so each student can try it on a press. Then we can really get into other things. So, what is mono printing? Monoprinting is a form of printing that has images or lines that can only be made ONCE, unlike most printing making, where there are multiple originals. But there are many techniques of monoprinting. (this is one of them). If you want to sign up for the class at Skeins on Main, you need to get the materials prior to the start of class. Here’s the Watercolor Monoprint Class flyer and materials list. .